Oh my gosh. I came over here to tell you that I've awarded you the Sunshine Award for knocking me off my chair with laughter, to find that you're also a Versatile Blogger, and, furthermore, moving??? I trust we'll be let in on more details BEFORE TOO LONG? What a cliffhanger! Can't wait to hear about this upcoming move. Laura's right: language acquisition happens in waves. Hills and plateaus (plateaux, 'scuse me). Don't sweat it. That is quite a surprise for your last random fact. I can't believe you are leaving LPV. I can't wait to hear the follow up story. Have a good Sunday. Whaaaaaaaa!?!??! Where are you moving???? And... good luck with the french improvement. And.. i LOVE the cosby show!! Say whaaat? I'm guessing you and The Husband bought a house somewhere in LPV. Yay! Congratulations! Moving...how exciting for you. I must check out the blogs you nominated. can't wait to hear the deets - i'm with ella. join us in paris! Leave it to you to leave a gal hanging...MOVING?! To where? Please do tell, merci. Sara, thank you so much for this award. It feels good to be liked! I've won this award a couple of times but the photo didn't look like this. I would love to put the award on my blog but if you don't mind, I'd rather not continue the chain. And seriously, I got nothin' left to tell about myself. So can I put it there? Now I'm dying to find out where you're off to. Since you say you need a refresher course in French, my guess is that you're not moving back home, right? Congrats! Although I must admit I am going to miss the "ponts". I might actually have to work now. Thankfully the month of August is right around the corner. To start the day winning... LOVE IT! And where are you moving? Must have more info a.s.a.p. i loved learning more about you and now i am very intrigued......to where are you moving?? Congrats on the move! Where ya going? Closer to the beach and sand? :) The LPV will miss you. Three day work-weeks sounds amazing!!!! Very jealous! Waiting . . . Doesn't it seem like eons since she sprung this moving thing on us? Do you hate deferred gratification??? Bonjour Sara. J m' appelle Rob-bear. Rob (comme Robert), et je suis un ours canadian. 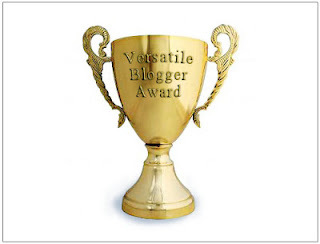 I arrived here from Amanda's blog, after you gave her the Versatile Blogger Award, which she passed on to me. You certainly seem to be a versatile enough person. With a husband who played rugby — a game my wife's husband played in university. I hope you have an uneventful move to wherever you are going. A la prochaine! Thank you so much Sara Louise for thinking of me for the award!!!!! I'm flattered! You're the best. I can't wait to hear more about the 'move'! Congratulations, you must be so excited!! !